It had been at least a few weeks since I looked at our iPhoto library. I have a 128 GB MacBook Air, so keeping a local copy has been out of the question for some time. But I’m no dummy, I back up regularly. I have a copy of the library on an external 1 TB Thunderbolt drive — which I use as my regular portable — and another copy stashed on the data partition of my Time Capsule. Neither of these are foolproof, and I know that, but it’s always worked. Even with the inherent risk. See, I’m no dummy. Nope. Not me. Any time we do a “photo dump” of our phones, cameras, etc, I hook the Thunderbolt drive up to the Air, open the library, and import everything we need to save. Then I hook the drive up to my Time Capsule and make another copy. Again, I know this is a terrible strategy, especially when dealing with invaluable memories. And yes, I had planned to embrace Bradley Chambers’s excellent workflow once I had the time. It should’ve been clear that changing my ways was urgent, but we don’t think that way until we get burned, right? I mean, we’re not dummies. When I hooked up the drive and fired up iPhoto this past Sunday morning, everything seemed normal. I scrolled up the library; about 10 years back and double clicked on a thumbnail. 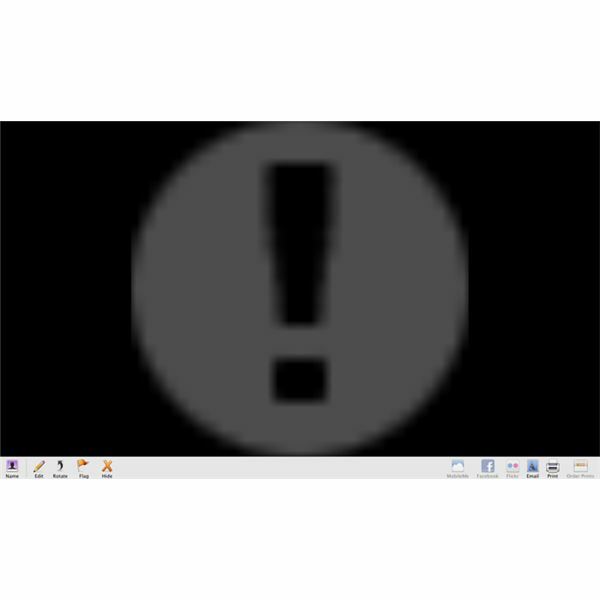 I was greeted by an image of a giant exclamation point. I hadn’t seen this before. “What in the hell?” came fumbling out of my mouth. Our bedroom is next to the office, and my wife overheard. I assured her it was nothing and decided that Bradley’s suggestions needed to be implemented. Right now. I hit ⌘-A in the photo view, and clicked on “Export” (which is horrible in iPhoto — more on that later). I was greeted with an “Unable to create…” dialog, which basically means that iPhoto can’t find the original files; only the thumbnails. Next, I decided to open the iPhoto database itself and dig around. This is where the panic began to set in. The “Original Files” and “Modified Files” folders were empty. I mean, nothing. Not a single image. Clicking through all sorts of who-knows-what in that database turned up zilch. I quickly logged into the Time Capsule and opened that copy of the database. Same thing. Empty. This is when the tears started streaming uncontrollably. Blubbering. Whimpering. All of that. I’m the tech person of the house, so when my wife came into the office to see what was causing my groans, she saw my face and naturally starting sobbing too. She knew that I had been working with our photos, and immediately knew that something was very, very wrong. We were in complete panic-mode. A photographic fugue state, if you will. My reaction may sound extreme, but here’s a number for you: 14,500. Fourteen thousand five hundred photos. Gone. And I didn’t know how or why, or what I could do to get them back. That’s not including the 75 or so hours of video that were missing as well. I needed to collect every backup disk I could find and check them for a viable library. But I didn’t really have that kind of time, nor could I remember which drives had what. Great backup strategy, huh? I mentioned that it was my son’s birthday and folks were coming over shortly after my horrifying realization that I had failed as a parent (yes, that’s what it felt like), and we needed to get things together. We still had some last-minute gifts to buy, and food to cook. So we went out. On the way to the store, my wife (still teary eyed) mentioned that I had sent her to her office with an external drive not too long ago. I honestly don’t even remember doing this, but figured we could stop and pick it up. It’s worth a shot, right? We bounced around to the stores we needed to hit, stopped at the office and headed back home. My heart was pounding as I plugged the drive in. A fully intact library was there — give or take a hundred photos. I sat back in the chair, feeling a little bit better based on the fact that I wasn’t a complete dolt. I had actually sent a backup to my wife’s office for safe-keeping. I seriously don’t remember doing it, but the point is that I did, and I suggest you do something similar. It started to come back to me; if god forbid the house caught on fire, I wanted the photos safe. I won’t re-hash what Bradley Chambers rightly recommends. Toss him the $3 and grab his short eBook; it’s absolutely worth it. I’m basically following it to the letter. It involves Dropbox, Everpix, and some solid backup strategies. He outlines everything clearly and explains all the costs involved. The big plus is it’s written for “normal people”, so you can share it with non-techy friends and family. I did however, use a couple of extra tools that eased getting to the goal of a Dropbox based library. Hazel’s great; I’ve talked about it before. But when you yank your photos out of iPhoto, and want to arrange them nicely in folders, Hazel goes from great to an absolute must. Read Sven Fechner’s article on moving your library, and specifically the part describing the app, Phoshare. Earlier I mentioned that exporting from iPhoto is pretty terrible, mainly because metadata is totally borked including the images’ “created date”. Phoshare fixes that quite nicely, preserving all metadata and copying all your images into a user-defined folder. So my process went something like this. Note that if you are meticulous with naming/dating your iPhoto Events, using Phoshare to export based on Event name should suffice. This stuff isn’t for everyone. Catastrophes like this probably won’t happen to most people. But the thing is, you don’t have a problem until you have a problem. It’s the same cringe-worthy talk we’ve had a million times with our parents about backing up data. I’d argue that this is more dire. Databases can be very stable, but I’m no longer willing to keep life’s memories in something that can seemingly turn on me in an instant. I still don’t know what actually happened; it could even have been my own fault. Doesn’t matter though. I need a more stable plan, and for now, Dropbox+Everpix is it. Dropbox could go away tomorrow, and I’ll still have a neatly organized folder with all of my photos that I’m free to clone for safety.